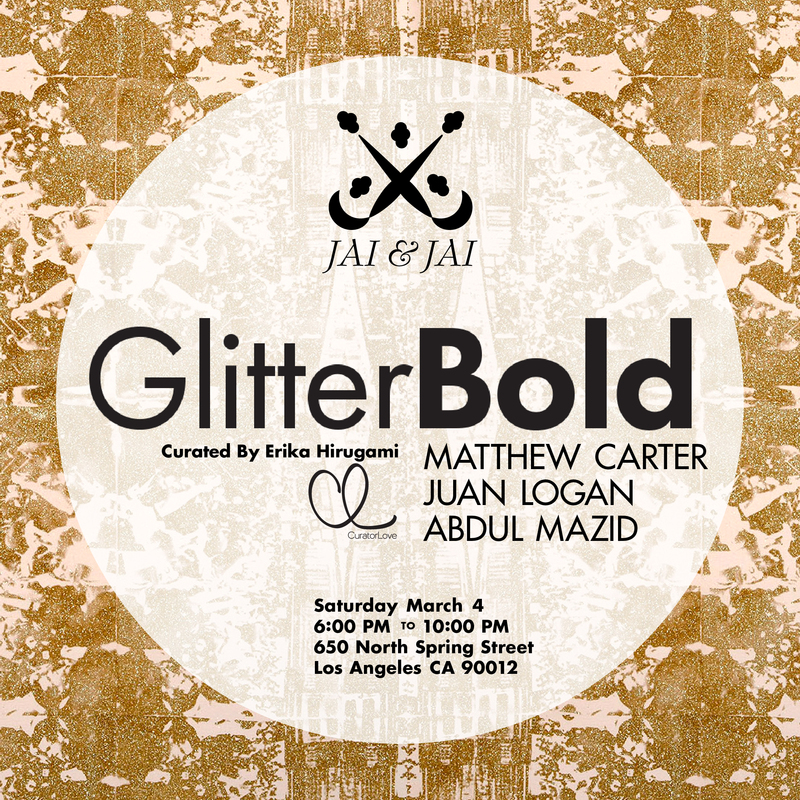 Jai & Jai Gallery is pleased to present ‘GlitterBold’ a group exhibition curated by Erika Hirugami with an opening reception on Saturday, March 4, 2017.
medium; simultaneously an evocative stand was taken by the key players in the game to better inform this dialogue. Conservators, museum collections, curators, and gallerists seem to have developed hostility toward the medium itself, whereas artists have begun to glitter-coat the art world from within. medium within the confines of their fine art practice, each bestowing the unrestrained material with a unique level of intricacy and a new agency. 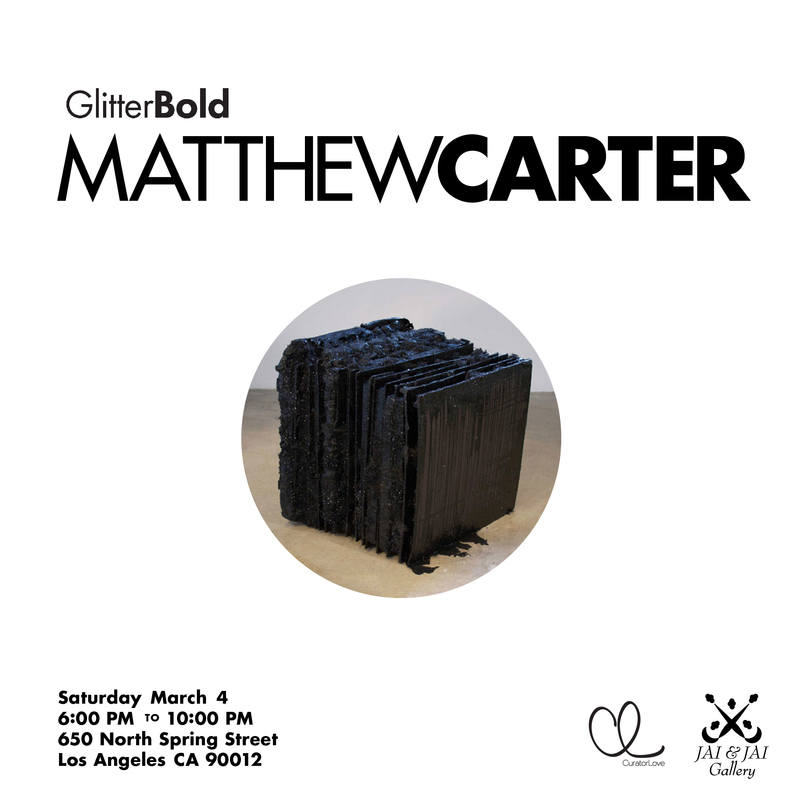 Matthew Carter conveys that glitter is “the material that is permanently smiling,” and makes use of it to signal the affiliation between figuration and abstraction. Within his body of work, he expands on these traditions of simultaneity. While capturing the viewer’s gaze with the shimmer of the glitter, and juxtaposing it to with the raw linen which aesthetically signals to a nature of instability. 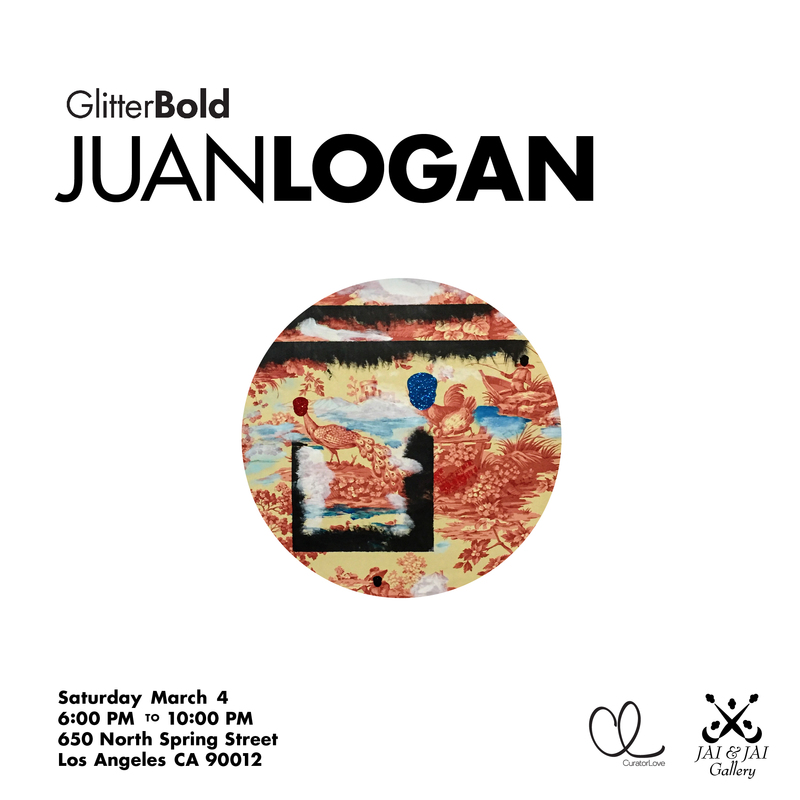 Juan Logan uses the playful and unrestrained medium, predominantly in the color black to signal to political and historical oppression. As he mentions “it is the love of the material as a tool” that drives and informs his choices. “In the process, the whole story is never on the surface.” Glitter thus serves him to convey layers of meaning into his aesthetic creations. 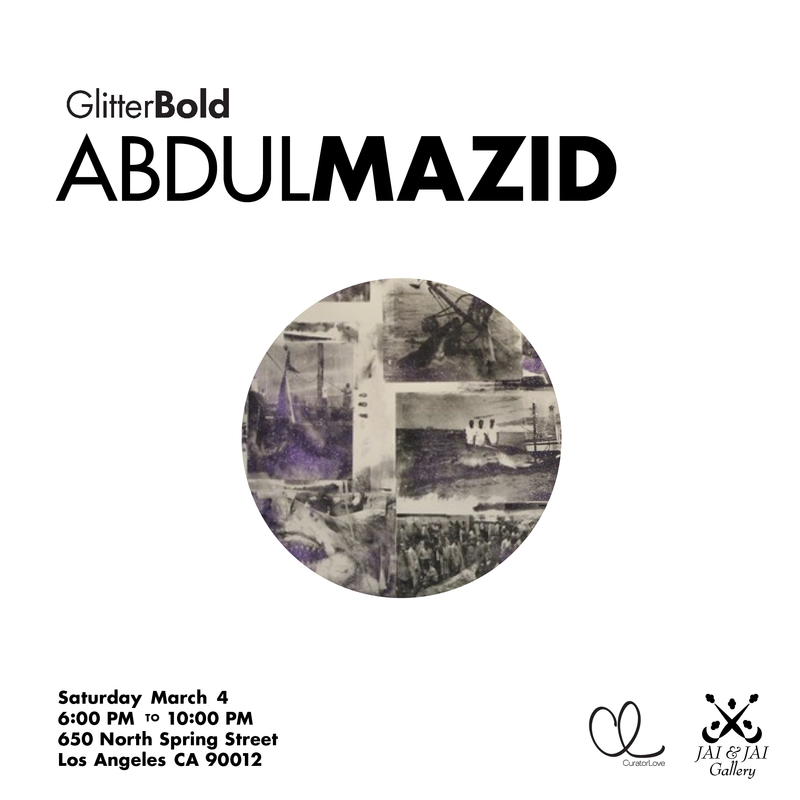 Abdul Mazid employs glitter to investigate alternative currencies; within his body of work, he questions the creation and destruction of value itself. 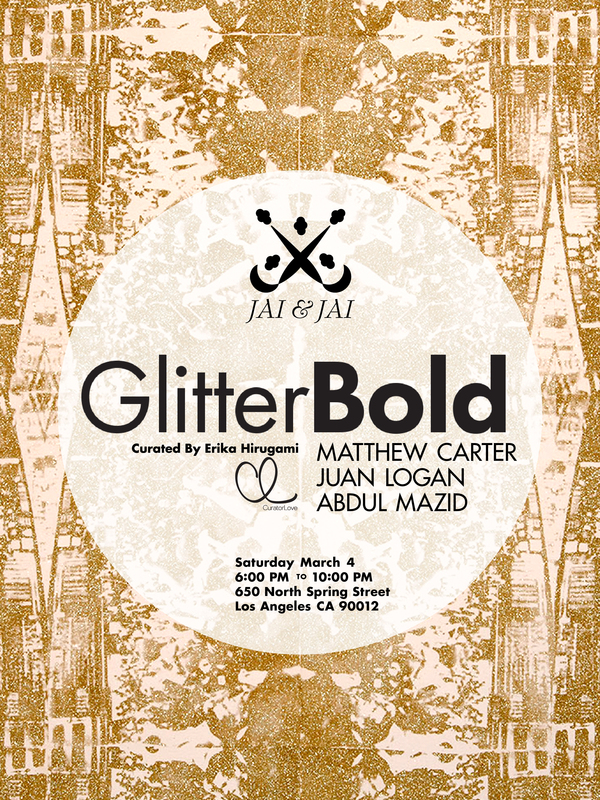 As he mentions, “I use glitter because of my interest in economics.” The medium itself and the implications it connotes allow Mazid to subvert the very agency of the structures the work needs to thrive, disrupting existing relations, and challenging its own channels while transcending commodification. In these three distinct instances glitter surpasses its own implications to become a tool of exploration. Carter, Logan, and Mazid bequeath the medium an agency that allows it to exceed playfulness and become thought-provoking. Moving past craft and femininity, glitter becomes bold, it becomes a challenge, it fights back. With each iteration, glitter transcends the fine art canon, and antagonizes commodification while eliciting a pleasure which cannot be quantified.